Presents the first efforts to explore ecological interactions between insects and plants across several trophic levels, with special focus on mediation of complex interactions by plant allelochemicals. First section looks at effects of plant allelochemicals on predator-prey and host-parasitoid interactions. 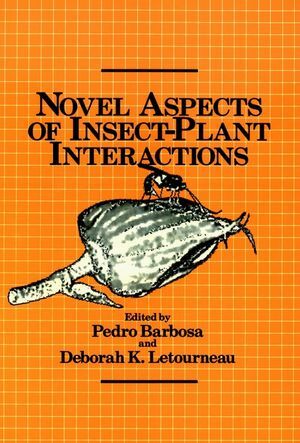 Second section reveals the role of microorganisms as mediators of interactions between insects and plants. Third section unifies and extends current theory to examine the effects of allelochemicals on the second and third trophic levels. Final section traces the physiological effects of plant allelochemicals in animal behavior, population regulation, maintenance of mimicry systems, and evolution of host range. Pedro Barbosa is a Professor of Entomology at the University of Maryland. His numerous publications include Readings in Entomology, Manual of Basic Techniques in Insect Histology, Insect Outbreaks, Novel Aspects of Insect-Plant Interactions and Introduction to Forest and Shade Tree Entomology. He received his BS from the City College of New York and MS and PhD degrees from the University of Massachusetts. Deborah K. Letourneau holds Bachelor's, Master's and doctoral degrees from the University of Michigan and University of California at Berkeley. As Professor of Environmental Studies at the University of California, Santa Cruz, her research concerns plant-insect interactions, biodiversity, and environmental risk in the context of decision-making that sustains both livelihoods and the environment. CONCEPTUAL FRAMEWORK OF THREE-TROPHIC-LEVEL INTERACTIONS. Allelochemical Interactions among Plants, Herbivores, and TheirPredators (D. Whitman). Influences of Plant-Produced Allelochemicals on the Host and PreySelection Behavior of Entomophagous Insects (D. Nordlund, etal.). MICROORGANISMS AS MEDIATORS OF INTER-TROPHIC AND INTRA-TROPHICINTERACTIONS. Agents Provocateurs in the Coevolutionary Arms Race (M.Berenbaum). Microbial Allelochemicals Affecting the Behavior of Insects, Mites,Nematodes, and Protozoa in Different Trophic Levels (M.Dicke). THEORY AND MECHANISMS: PLANT EFFECTS VIA ALLELOCHEMICALS ON THETHIRD TROPHIC LEVEL. Parasitoid-Host-Plant Interactions, Emphasizing Cotton (Gossypium)(H. Williams, et al.). Natural Enemies and Herbivore-Plant Interactions: Influence ofPlant Allelochemicals and Host Specificity (P. Barbosa). KEY ROLES OF PLANT ALLELOCHEMICALS IN SURVIVAL STRATEGIES OFHERBIVORES. Plant-Derived Defense in Chrysomelid Beetles (J. Pasteels, etal.). Plant Allelochemistry and Mimicry (M. Bowers). Potential Role of Plant Allelochemicals in the Development ofInsecticide Resistance (L. Brattsten).